Making the decision to have an epoxy coating applied to the surface of any flooring is not the final decision to make. The next decision is about aesthetics and enhancing safety. With many colors and patterns to choose from among the many epoxy floor coating finish options available, every project can take on the custom appearance desired along with having improved function and longer life. Solid Color: Where might a solid color suit an epoxy floor coating best? This is the perfect solution to dressing up an outdoor walkway. In addition to the uniformity of a solid color clearly outlining a path of travel, there are pattern options available to dress it up. A plain, concrete walkway becomes an inviting flagstone or brick path, just asking to be explored. There is also a custom stain selection chart that can transform a solid plane of concrete or plywood into the illusion of a classic marble floor. Variations of tint and hue for colors of gray, blue, terra cotta, and neutrals offer the opportunity for every walkway to complement an adjacent structure’s color scheme on any path constructed of wood or concrete. Weatherproof outdoor walks with a coating that protects and seals against water and UV, lengthening the life of your outdoor features. Colored Quartz: For high-use flooring that needs a bit of glamour appeal, a beautiful quartz finish seals the deal, so to speak. This is a particular favorite for automotive showrooms that want to show off their prize models. 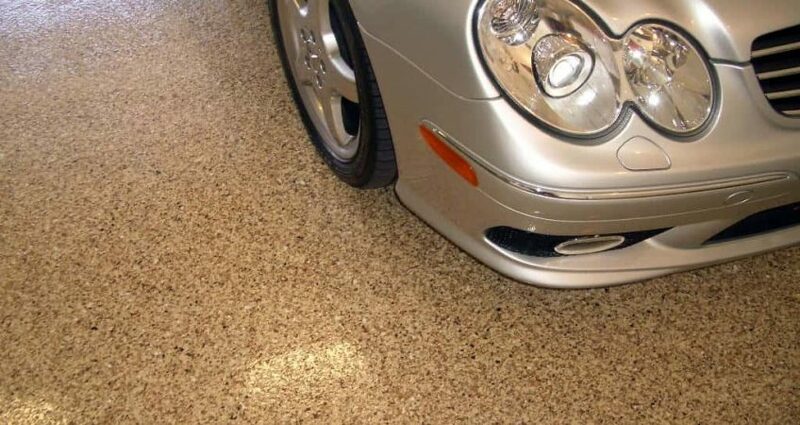 Not only is this epoxy/quartz coating blend absolutely gorgeous, it is also skid resistant. Considering how many customers flow through a showroom viewing the latest automotive designs, it is no wonder that auto dealers would be as concerned with safety as aesthetics. The durability of this finish is also resistant to chemical spills, such as oil or fuel. The seamless flooring system is easy to clean with water and mild detergents. This aspect is what makes this finish the perfect solution for work areas like pharmacies, laboratories or air craft bays in addition to your local auto dealer. Troweled Slurry: If you have an area where a concrete floor needs to be incredibly durable, a troweled slurry finish is the best choice for optimum protection. This is the perfect floor surface for a working garage, free-weight gym, aircraft hangar or parking area for heavy equipment. The coating creates a high-built surface that starts with a durable base coat. An intermediate base coat of epoxy enriched slurry is then added. This is what sets a troweled slurry floor coating system apart from all others with regard to strength and durability. Final finish is a coating application about 1/4″ thick. Once the coating cures it has compressive strength of 10,000 psi and a flexural strength of 4,300 psi. This floor coating system is designed to endure just about any abuse industry can throw its way. Acrylic Chip: For floor surfaces coated with a troweled slurry, one of the most functional finish options is acrylic chip. Although a complementary color selection will certainly dress up a solid color, you will be doing much more than just adding a bit of color variation. An acrylic chip finish also integrates a dual safety feature. Safety specific colors, such as red and yellow, help to delineate the layout of the floor. It also creates a texturized feature that enhances the no-slip quality of an epoxy floor coating. Creativity thrives in coating and finish options that transform any concrete or plywood surface into a thing of lasting beauty as well as creating a surface that is much safer to enjoy. Explore color and finish options. Let your imagination guide you through the design process for your own flooring project. Please contact us with any questions about the Pli-Dek System and how it can provide you with a beautiful, long-lasting flooring surface.